The ends of the bones within a joint are covered by a spongy tissue called cartilage, which is lubricated by synovial fluid. These help in the smooth, friction-free movement of the joints. Wear-and-tear or damage to these tissues can lead to arthritis. Arthritis is an inflammatory condition of the joints. Arthritis of the thumb causes swelling, pain, stiffness, and malformation, all of which interfere with the opposable functioning of the thumb. It is more common in women over40 years of age, and may occur due to wear-and-tear of the cartilage (osteoarthritis), autoimmune disease (rheumatoid arthritis), or prior fractures or injuries to the joint (post-traumatic arthritis). Your doctor performs a thorough physical examination and orders blood tests, X-ray imaging and bone scans of the wrist to diagnose and ascertain the severity of arthritis. Osteotomy: This involves the rearrangement of the affected joint where the bones may be cut to remove excess growth. 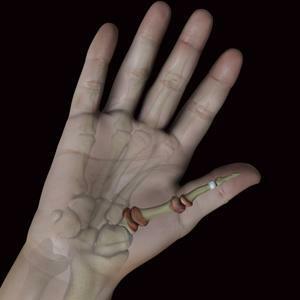 Trapeziectomy: The trapezium, a bone in the thumb joint is removed. Arthroplasty: In this procedure, your surgeon removes the affected joint and replaces it with a graft from a tendon. Arthrodesis: Also called a fusion, an arthrodesis involves removal of the damaged regions of the bones of a joint and then fusing the bones together, using metal wires or screws for support. This limits movement of the thumb. Your surgeon will discuss your options and help you decide which type of surgery is most appropriate for you. Following surgery, a rehabilitation program involving physical therapy may help regain hand strength and movement. You may need to use a splint or cast for a while after surgery to protect the thumb while it heals, and modify activities to let the joint reconstruction heal properly. You should be able to resume your normal activities within a few months of surgery.